Full-skirted black evening gown with ruffled skirt and large bows. One of 228 dress designs for Winter 1939-40 bound in volume. Madeleine Wallis became artistic director of the House of Paquin in 1920 following Jeanne Paquin's retirement. Wallis remained at Paquin until 1936, the same year Jeanne Paquin died, when she also left and was succeeded by the Spanish designer Ana de Pombo. During the Second World War, de Pombo returned to Spain, and her former assistant, Antonio del Castillo, became Paquin's artistic director. Under Castillo's direction, Paquin was one of the couture houses that stayed open in Paris during the Second World War. In 1945, del Castillo left to work for the American entrepreneur Elizabeth Arden, and was replaced by Colette Massignac, who was at Paquin until 1949. The Basque designer Lou Claverie succeesed Massignac, until 1953 when he was succeeded by a young American designer, Alan Graham. 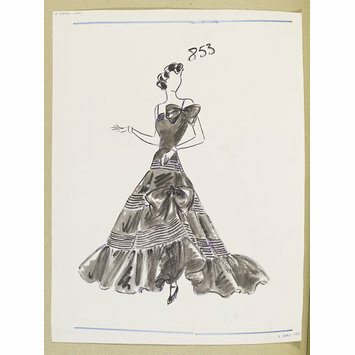 Graham then designed Paquin's last few collections before the house closed on 1 July 1956. Although little is currently known about the London branch of Paquin, like that of Worth London, it probably operated under a separate design team. 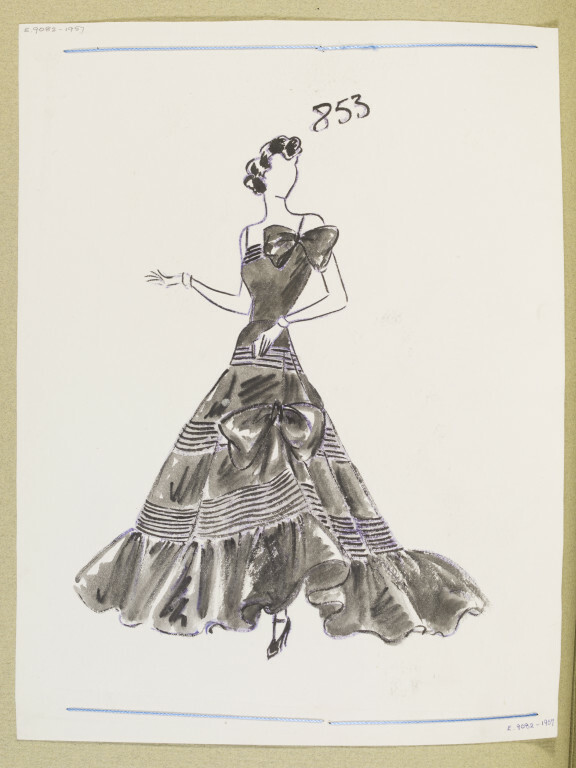 While many London branches of couture houses (such as Schiaparelli) relied exclusively on Paris designs, it is known that the Italian-born designer Bianca Mosca (d.1950) was appointed head designer for Paquin London in about 1937, and stayed at Paquin during the Second World War. Mosca was also concurrently head designer at Jacqmar, and as a member of the Incorporated Society of London Fashion Designers she represented both Paquin London and Jacqmar. Mosca went on to design under her own label from 1946 until her premature death. While the business of Paquin London survived the War (despite its premises being destroyed by enemy action during the Blitz) it appears to have closed around the same time as the Paris establishment. Paquin (Ana de Pombo). Full-skirted black evening gown with ruffled skirt and large bows. One of 228 designs for Winter 1939 bound in volume.